This year is ending, thank God! 2012 has been rough. The birth of this blog came at the death of a business I’d been nurturing for 14 years. I should have let it die two years earlier instead of forcing it along and sacrificing my soul. Sometimes you have to be beat over the head by the universe. I guess I’m stubborn. I got beat over the head and thrown under the bus before I let go. I started this blog with the idea that I would document emptying my paint stash in two years. I had also hoped that along the way I would find a new passion. Thankfully that has happened. I’m in the midst of creating something new that I will reveal sometime this winter. I am still destashing and will continue to post each of those projects. I’ll also continue my trips to the flea markets and antique shows and bring you back some post cards. Even though this year has brought me many trials, it’s brought me more blessings than I can count. I’m really looking forward to the new year and hope you’ll keep following along. I’m off working but will post later with the photos of the final parting shots from O’Farrell Community School. Talk to you later, and thanks for your support! My product stash grew to this unwieldy size through many years of projects in my decorative paint business, which means the products aren’t exactly my style or my favorite color. In general I lean toward loud colors and bold patterns. 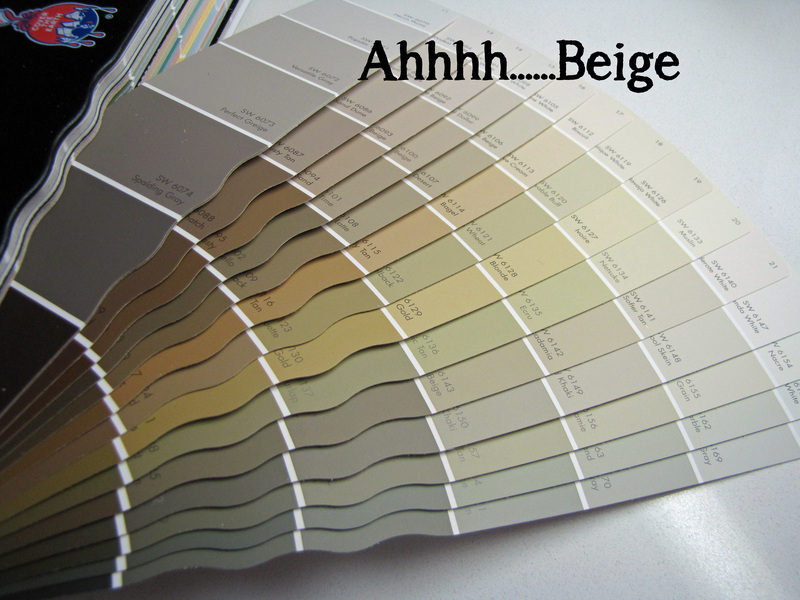 But in the last 14 years I have learned that most people like beige. I don’t know that they like beige, actually, I think they just feel safe with beige. No one’s going to judge you for beige walls with taupe accents….at least not to your face. All I can say is, you’d be surprised what husbands like. They don’t even know what they like. My husband was a white wall guy when I met him. Now he goes in to other people’s beige homes and calls them pussies. (This totally happens so think twice before you invite us over.) Before I change things at home he always questions it but never stops me because he’s learned that even if he can’t picture it, he will probably love it. I wouldn’t go so far as saying he trusts me, because he doesn’t, but he definitely doesn’t stop me. So my biggest concern in this destashing challenge is that a lot of the products in my stash are beige. Dark beige, almost dark beige, light beige, not quite coffee colored beige, etc. But that’s what colorants are for so thank goodness I have a lot of those. Mix on! My husband and I dream about leaving the suburbs when our daughter graduates high school in 2 years. The burbs have been the perfect place to raise her, but we’re totally done with yard work and having our weekends consumed by thatch removal. We want to downsize to a loft in downtown San Diego, which means I’ll have considerably less storage space for all the products I’ve accumulated over the last 14 years working as a decorative paint contractor. 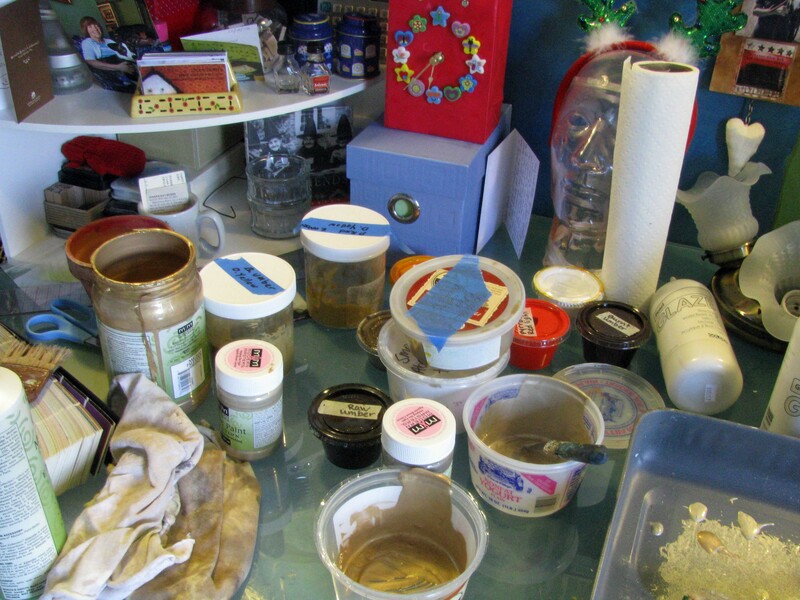 Destashing is just what you think it is….getting rid of your stash. My goal is to destash the bulk of my inventory by July of 2014. I plan to get rid of most of it by just plain using it up. Whether in my own home, a friend’s or on pieces that I turn around and sell in my Etsy shop. Using the products will be the quickest, and funnest way to get rid of it but probably not enough. Another way to destash will be trading products with friends for something I need, i.e. “I’ll trade you a gallon of Antique Cherry Stain & Seal for a gallon of Aquacreme.” (I’m not kidding, I have a GALLON of that stuff!) This appeals to me mostly because I’m trying to do this as cheaply as possible. Donating to groups or individuals in need will also work. I’ll sell products when people don’t have anything to trade or when I just plain can’t use it. Not buying new products will force me to mix my own colors. It will also encourage me to use products in new ways just to get rid of it. I have broken my inventory (Stash page) down into categories and will replace products only when a category is empty. And now for a little lesson in color…..You can make nearly every color with white, black, red, yellow and blue. So if a color is needed that I can’t make because one of the primary or tint colors is gone, that’s when I’m allowed to purchase a new one. My goal will always be to work with what I’ve got so I’ll try to keep working with the colors I have for as long as possible.